This jacket is so adaptable, and so flattering, you will wear it and wear it! The photo is unfortunately dark, but the fabric is comprised of variously patterned blocks. Combinations of bobbles and bells embellish the blocks of stockinette and reverse stockinette. 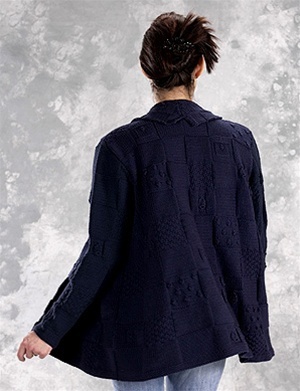 Merino 8 has beautiful stitch definition, so you will love both knitting and wearing this classy jacket! See the many colors of Merino 8 here. Finished Chest 46" 49" 53"